It’s a very small thing, the bee on an Emma Bridgewater mug, but now I know that someone actually put it there with their own fair hand and a tiny hand-cut sponge, it means so much more. I can't help thinking – “Thank goodness businesses are now letting film crews film their process”. It has long been hidden behind factory doors and as a result we have taken for granted as consumers how much work goes into the good things we buy. Do you know that some of these pottery painters have been doing this for more than 15 years, and every single bee, spot, swirl and flower is painted by hand, then signed at the bottom by each artist? 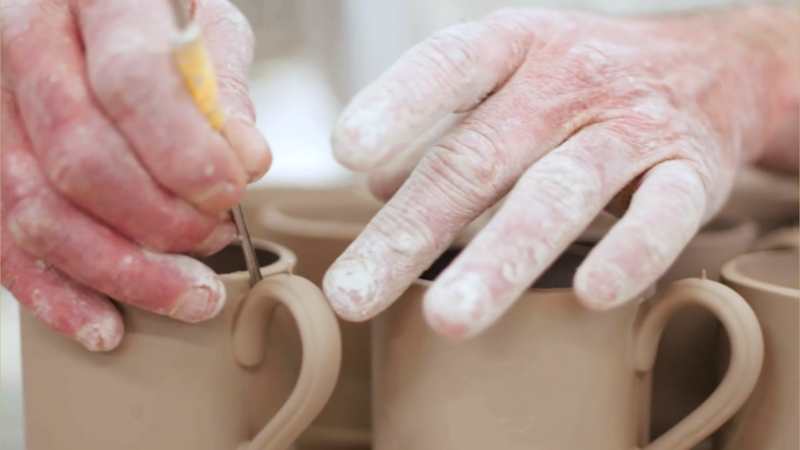 Each mug goes through 30 pairs of hands and a dozen different processes before they are checked by an eagle eyed quality control lady and sent out into kitchens and cupboards all over the world. I do wonder why on earth they haven't taught a robot these things but I'm glad they haven't. There’s something special about knowing that human hands have created the item now in your hands. Until customers know a bit more of the journey their products have been on they will only ever want to get things as cheaply as possible. But gradually, as they find out more about the skills involved, the creativity applied and the livelihoods they are supporting by their purchase they'll show more respect and appreciate its value. So don't hide your unique process under a bushel, customers love to understand it, and love your products more because of it!